Aaron Scott began his new year celebrations early with a comfortable win in the Ely New Years Eve 10k. Scott ran the first half of the race in the company of eventual runner-up Chis Darling of Cambridge and Coleridge AC. 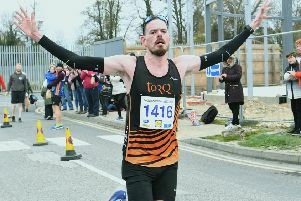 The Stamford-based athlete, who now runs in the colours of Lincoln Wellington AC, then broke away to win in a speedy time of 31:53, some 42 seconds clear. He picked up a winner’s cheque for £130. Nene Valley’s Philippa Taylor finished 16th overall and was the second lady home. Taylor was unable to stay with the race winner Kelly Grant of City of Norwich AC, who crossed the line in 36:41. However, the 49 year-old England cross-country international with 37:44 was first veteran home by some 90 seconds. Thorney AC’s Peter Ward was the leading Over 50 finisher in a time of 39:15. Phil Martin of Bushfield Joggers enjoyed a successful festive period running a new PB of 34:41when finishing third in the Waterside 10k at Grafham Water on Ddecember 27. The British Masters marathon and half-marathon title holder had an even better run on New Years Eve when taking the honours in the RAF Marholm 10k. Nene Valley Harriers veteran Sean Reidy set a new personal best (PB) of 30.04m when winning the Over 35 hammer competition at a throws meeting at the Embankment on New Year’s Eve. Under 13 - 1 Danielle Pusey (NVH) 14.71. Under 20 - 1 Lydia Church (NVH) 34.73. Over 35 - 1 Sean Reidy (NVH) 30.04 (PB). Over 40 - 1 Simon Achurch (NVH) 40.03. Over 65: 2 John Blackwell (NVH) 28.85. Over 65 - 1 John Blackwell (NVH) 29.27.